Adventure games, an established and popular genre among microcomputer enthusiasts, are generally divided into two categories: text adventures and graphics adventures. This dichotomy seems clear enough: a text adventure uses words alone, similar to books or radio plays, to create a picture in the mind. A graphic adventure, in contrast, draws these pictures for the eye. Each category claims its own adherents. Text adventure aficionados assert that only verbal descriptions can provide a satisfactorily rich level of story telling, as they leave most of the visualization to imagination. For these people, a good adventure is like a good book-a reading experience. Graphic adventure chauvinists point out correctly that text adventures employ a very static screen display. This is wasteful, they argue, in light of the capabilities of microcomputers. Graphics potential (and sound potential, for that matter), should not be left unexploited by the adventure program. Each faction has a well-taken point. The fact is, however, that the division between text adventures and graphic adventures is not nearly as sharp as this, and some of the most interesting developments in microgames are taking place between the two poles. All graphics adventures employ text to one degree or another--either to augment the graphic display or as the basis for graphic augmentation. Let's examine these approaches more closely. One method of constructing graphic adventures might be called the illustrated text adventure. This employs all the normal conventions of a text adventure, including text command input, though the text may be less descriptive and more to the point. In addition to this, the player is provided with an illustration of his or her current position via a high resolution picture. These are stored on disk and are called out as necessary by the main, text-oriented program. The simile is close to the idea of a comic book. Each piece of the story has its own "frame" of picture and text. The point of view is that of the central character--the player sees the locations as if he were there. Another approach results in the mapped adventure, wherein the player or players appear as symbols on a map. This map depicts the details of the location, indicating the type and placement of terrain, walls, objects, and enemies, among other things. Player movement is input through keyboard or joystick. As a character reaches the border of a screen map in any direction, either the screen begins to scroll in that direction, or a new location map is drawn. This creates a more omniscient perspective, with the player looking down on his character's movement from above. Typically this type of adventure does not allow text input, but limits the player to a certain number of possible contingencies in a menu or command format. The comparison between text adventures and mapped adventures is close to that of a fill-in-the-blank vs. a multiple-choice test. Text adventure enthusiasts feel the menu format is restrictive--one can only choose to move or stand still, flee or fight, take or drop, and so on. The mapped adventure began as an outgrowth of a certain fantasy role-playing game whose name we are not permitted to print. One obvious advantage of this format is the capability for multi-character play. Until quite recently, the preference boiled down to a choice between the classic-style text adventure game and the fantasy role-playing adventure. However, hybrids are now being developed that now provide both types of enjoyment. Truly hybrid adventure games of the future will offer the best aspects of all approaches to computer gaming. Textual description will provide detailed background and help set the mood. Maps will be available to indicate position (except in areas still unexplored). Computer graphics and sound will be called on where appropriate to animate action sequences. Arcade-style challenges will become part of the stories, calling for feats of coordination before the plot advances. And it won't be too long before the videodisc becomes a necessary peripheral for state-of-the-art adventuring. This is still a ways off in the future. That is quite enough background, however, to examine the spectrum of graphic adventure software currently available for the Atari. In the arcade game Asteroids, you use hand-eye coordination to zap as many asteroids as possible in the few minutes you are allotted. In Mission: Asteroid, your job is to destroy just one asteroid, and you have several hours in which to do it. 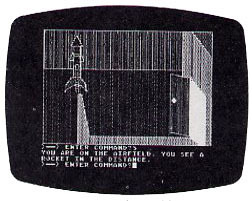 The game allows you to input two-word commands, and displays a high resolution picture for every location, with a four-line text window at the bottom of the screen. Pressing return without entering text will kill the picture momentarily, giving you a chance to recall the last 24 lines of the text that have scrolled by. Tap return again and the picture will reappear. The plot line of Mission: Asteroid is pretty easy to follow; it was designed as an introduction to a series of "Hi-Res Adventures" of much greater complexity. That is not to say that the game is easy to solve--it's not. Briefly described, you are an astronaut, who is sent into deep space to destroy an asteroid headed toward earth. You have only a limited amount of time before the asteroid collides with earth and the game is over. It is interesting to gauge the reactions of text adventure buffs to the over 100 pictures on the disk. Some enjoy them thoroughly, others use them as mnemonic devices, which eliminate the necessity to map the adventure on paper. Still others find the pictures a questionable, if not downright distracting, addition. The pictures are well-done--obviously a lot of time was spent executing them. They are pretty, but they do not achieve even the quality of a well-drawn comic book. This leaves me a little dissatisfied. I think it is fair to ask of any graphic adventure game: How well would the adventure stand on its own, if we were to delete all the pictures? In the case of Mission: Asteroid, the plot line is kept intentionally simple, as it is intended to be an introduction to a series of graphic adventures, and it is an enjoyable program. As such, it would not be really entertaining without the pictures. The graphics serve to enhance the overall effect, but are unable to enrich the story significantly. In the intricate and involving stories of other adventures in the series, they stand a better chance of achieving this goal. I am certainly among those who feel illustrations can improve text adventures. Apparently so is Scott Adams, who is in the process of re-releasing all twelve of his now-classic adventures as illustrated text adventures. Ali Baba and the Forty Thieves attempts to move beyond the illustrated text adventure. 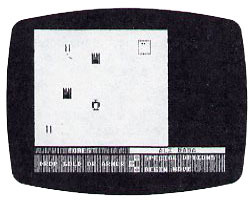 It was designed for the Atari, in contrast to Mission: Asteroid, which is an Apple translation. The game makes use of some of the special features of the Atari, such as multi-channel sound. It is an example of a mapped adventure, wherein players are depicted on a multi-colored map. As the players move to new locations, new areas of the map are displayed. When you first sit down with Ali Baba, you may not get up for several hours. The game shows strong potential when you see it for the first time. It allows for a total of 17 characters to participate simultaneously in a search to rescue a kidnapped princess. This adventure leans heavily in the direction of a fantasy role-playing game, assigning weights to the attributes of each character. From my experience, this makes for a much more lively game when friends are sitting in. Instead of everyone in the room discussing what the sole character in a text adventure should do, everyone can be his own character, interacting within the adventure as well as with each other. The discussion takes on new depth as individuals decide what course to take for themselves. In Ali Baba you can choose to become one of the set of humans, elves, halflings or dwarves that are profiled in the extensive documentation that accompanies the game. Each of these sets of beings is represented by a different symbol on the screen. Using the keyboard or joysticks to input movement, players can explore the caverns, palaces, passages, and treasure rooms of the game--and happen upon the dangerous inhabitants therein. The game is immediately addictive, and is really tough. The first thing the novice should do is turn the "monster recurrence" level down to zero. This will keep him from becoming utterly, bogged down in fending off attackers. You'll spend hours wandering around, acquiring treasures, buying weapons and armor, fighting enemies and thieves, and searching for the princess. Characters can be reincarnated if they are snuffed out, and reinforcements can be called in when the going gets really heavy. As in other role-playing games, each character has unique attributes. Elves are fast and hard to hit; dwarves are slow and clumsy but when they connect they pack a heavy blow. This richness of character is the strong point of the game. The adventure has some other interesting features. It can be configured to play through nested menus, controlled completely by one or more joysticks, eliminating keyboard entry completely. Characters can be retired as well as reincarnated, and in fact Ali himself can be retired if no one wishes to take his role. Characters other than players wander through the game, and will sometimes attack each other, allowing players to make a fast getaway. The map graphics, Arabic-style typeface, music, and sound effects are quite good. The problem with Ali Baba is the way it ends. After much exploration and fighting, you will discover the princess, and fight valiantly to return her to the king. When you manage to do so, the king thanks you, gives you some gold, and invites you to go back to amass more treasure. And that's it. It's a rather sudden let down, and it leaves players without the feeling they have mastered a difficult puzzle. The documentation states that All Baba, himself a relatively weak, slow, and unskilled character in the adventure, can reach and rescue the princess unaided, and without once raising his sword to fight. As it still seems impossible to me after several hours of trying, this poses the challenge of a real puzzle. Realizing how much more fun it is to play this type of game with other people. I think it's a shame that the challenge evaporates so quickly in the multiplayer game. Still, fans of role-playing games may really enjoy Ali Baba. It employs some nice concepts in its execution. For those protracted sessions, multiple games can be saved to disk. Purist adventurers who feel arcade games are beneath them may wince at the inclusion of Action Quest in an article on adventure games. It is, in fact, a rather radical departure from the format of traditional adventure games. Action Quest, despite the uninspired title, deftly exhibits some of the qualities of the mapped adventure: it draws a map of current location, provides a running status report, and allows character movement to be input by joystick. Pull on the stick, and your character scrolls smoothly across the screen. 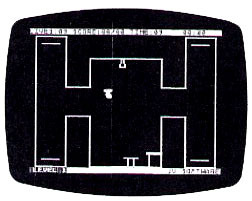 Head for a portal, and a map of your new room location appears on the screen. But the game transcends the typical adventure from here on in. Action Quest is a one player arcade-style game within an adventure format--and it is addictive, well-paced, and fun. The game is divided into five levels of six rooms each. If you complete all the required actions of each room, including gathering treasures, completing obstacle courses and traversing mazes, you may advance to the next, more advanced level of play. You encounter numerous monsters, dodge bullets, run through rooms with walls closing in on two sides, and happen upon mystifying puzzles that must be solved. You carry a gun which you aim with the stick (this takes time to master), and while without it you wouldn't last too long, I still would not call this a "shoot'em-up" type game. You have ten lives, which is not as generous as it sounds, considering the rate at which you expend them. Each room has a name, which gives a clue concerning what you need to do to get through it. The only problem is that by the time you have read the name for the first time, you may already have been skewered by some bizarre creature. You play against the clock as well as attempting to get through as many levels of the game as you can. This ensures you may still enjoy the game even after you have completed the adventure. I do not wish to instill the idea, however, that you will get all the way through Action Quest in any short amount of time. Mastery requires the acquisition of some formidable skills. At the end of the game your score is tallied, and you are assigned a rating on the basis of time used, lives expended, and treasures amassed. Perhaps it is a stretch to label Action Quest as an adventure game, but it is an exciting move in the right direction. The game is strong in one of the fundamental aspects of computer gaming: building toward a goal. Though the sound is somewhat unsophisticated, the graphic animation is well-executed. Your character is an undulating ghost, and as remaining in one room for too long can be fatal, it begins to fade slowly when you enter a room. If the ghost disappears completely, it costs you a life. Sometimes you must shuttle between rooms quickly to avoid "suffocating" in this manner. The author of Action Quest has indicated that a sequel with greater challenges, as well as more sophisticated graphics is in the works. I, for one, am looking forward to it.